This document provides sample configurations on InterSwitch Link (ISL) and 802.1Q trunking between a Catalyst 3512-XL switch and a Cisco 2600 router; the results of each command are displayed as they are executed. Cisco 3600 and 4500/4700 series routers, or other members of the Cisco 2600 series routers, with FastEthernet interfaces, and any Catalyst 2900XL, 3500XL, 2940, 2950 or 2970 can be used in the scenarios presented in this document to obtain the same results. We will create a trunk that will carry traffic from two VLANs (VLAN1 and VLAN2) across a single link between a Catalyst 3500 and a Cisco 2600 router. We are using the Cisco 2600 router to do the Inter-VLAN routing between VLAN1 and VLAN2. Catalyst 2900XL/3500XL/2940/2950/2970 series switches are Layer 2 (L2) switches, and are not capable of routing or communicating between the VLANs. 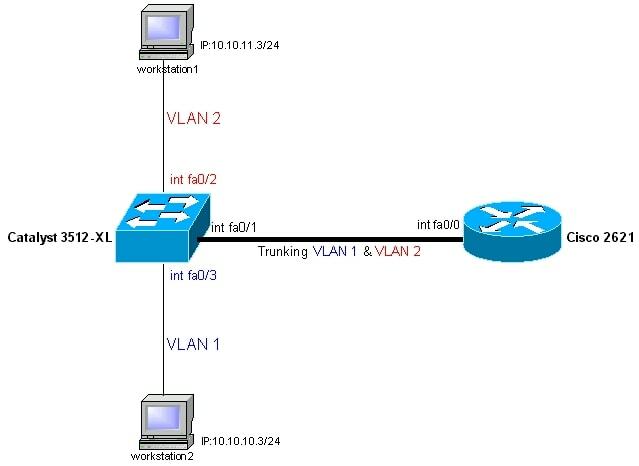 For further details on Inter-VLAN routing, refer to the Routing Between Virtual LANs Overview chapter of the Cisco IOS® Switching Services Configuration Guide, Release 12.1. The configurations in this document were implemented in an isolated lab environment. Ensure that you understand the potential impact of any configuration or command on your network before using it. The configurations on all devices were cleared with the write erase command to ensure that they have a default configuration. Catalyst 2940 and 2950 series switches only support 802.1q trunking, and do not support ISL trunking. WS-C2940-8TF ISL Not Supported 12.1(13)AY 12.1(13)AY or later for 802.1Q. ISL is not supported. WS-C2940-8TT ISL Not Supported 12.1(13)AY 12.1(13)AY or later for 802.1Q. ISL is not supported. WS-C2950-12 ISL Not Supported 12.0(5)WC(1) 12.0(5)WC(1) or later for 802.1Q. ISL is not supported. WS-C2950-24 ISL Not Supported 12.0(5)WC(1) 12.0(5)WC(1) or later for 802.1Q. ISL is not supported. WS-C2950C-24 ISL Not Supported 12.0(5)WC(1) 12.0(5)WC(1) or later for 802.1Q. ISL is not supported. WS-C2950T-24 ISL Not Supported 12.0(5)WC(1) 12.0(5)WC(1) or later for 802.1Q. ISL is not supported. WS-C2950G-12-EI ISL Not Supported 12.0(5)WC(1) 12.0(5)WC(1) or later for 802.1Q. ISL is not supported. WS-C2950G-24-EI ISL Not Supported 12.0(5)WC(1) 12.0(5)WC(1) or later for 802.1Q. ISL is not supported. WS-C2950G-48-EI ISL Not Supported 12.0(5)WC(1) 12.0(5)WC(1) or later for 802.1Q. ISL is not supported. WS-C2950SX-24 ISL Not Supported 12.0(5)WC(1) 12.0(5)WC(1) or later for 802.1Q. ISL is not supported. WS-C2950-24-EI-DC ISL Not Supported 12.0(5)WC(1) 12.0(5)WC(1) or later for 802.1Q. ISL is not supported. WS-C2955T-12 ISL Not Supported 12.1(13)EA1 12.1(13)EA1 or later for 802.1Q. ISL is not supported. WS-C2955S-12 ISL Not Supported 12.1(13)EA1 12.1(13)EA1 or later for 802.1Q. ISL is not supported. WS-C2955C-12 ISL Not Supported 12.1(13)EA1 12.1(13)EA1 or later for 802.1Q. ISL is not supported. Note: In the above table, only WS-C2916M-XL is a 4 MB DRAM switch. All the other switches listed are 8 MB DRAM switches. To determine whether your switch has 4 MB or 8 MB of DRAM, enter the user-level show version command. For more information, see the How to Determine the Amount of Switch Memory Using the Command Line Interface section of Upgrading Software in Catalyst 2900-XL/3500-XL Switches Using the Command Line Interface. Note: In Catalyst 2900XL/3500XL/2940/2950/2970 switches, a VLAN interface, for example, int vlan 1, int vlan 2, int vlan x, can be created for each and every VLAN that is configured on the switch. However, only one VLAN can be used at a time as a management VLAN. The IP address is assigned to the VLAN interface of the management VLAN only. If the IP address is assigned to another VLAN interface whose VLAN is not used as management VLAN, that interface will not come up. It is preferred to create the VLAN interface only for the management VLAN. For 802.1Q trunking, one VLAN is not tagged. This VLAN is called native VLAN. The native VLAN is used for untagged traffic when the port is in 802.1Q trunking mode. While configuring 802.1Q trunking, it is very important to keep in mind that the native VLAN must be configured the same on each side of the trunk link. It is a common mistake not to match the native VLANs while configuring 802.1Q trunking between the router and the switch. For details on native VLANs, refer to the IEEE 802.1Q section of Bridging Between IEEE 802.1Q VLANs, in New Features in Release 12.1(3)T.
In this sample configuration, the native VLAN is VLAN1, by default, on both the Cisco 2621 router and the Catalyst 3512XL switch. Depending on your network needs, you may have to use a native VLAN other than the default VLAN, VLAN1. Commands have been mentioned in the Configurations section of this document on how to change the native VLAN on the Cisco 2600 router and Catalyst 3500XL switch. Sample configurations presented in this document can be used on Cisco 2600/3600/4500/4700 series routers with Fast Ethernet interfaces or Fast Ethernet network modules. Also, make sure that you are using the Cisco IOS version that supports ISL/802.1Q VLAN trunking. For a complete list of Cisco 2600/3600/4500/4700 routers that support ISL/802.1Q VLAN trunking and the supported Cisco IOS versions, refer to Table 2 below. Note: Table 2 only lists the minimum or current maintenance/main releases that support this sample configuration. Router models with certain network modules may have different minimum Cisco IOS versions. For a complete list of minimum supported software for any router family, use the Software Advisor (registered customers only) . Note: The minimum supported release may not necessarily be the recommended release. To determine the best maintenance release for your Cisco product, search for bugs listed by product component in the Bug Toolkit (registered customers only) . Note: Table 2 lists the minimum feature set required to do IP Inter-VLAN routing and trunking to support this sample configuration. For a complete list of other feature sets supported in different Cisco IOS versions and on different platforms, use the Download Software area. Note: The encapsulation dot1Q 1 native command was added in Cisco IOS version 12.1(3)T. If you are using an earlier version of Cisco IOS, refer to the 802.1Q configuration for Cisco IOS Versions Earlier than 12.1(3)T section of this document to configure 802.1Q trunking on the router. Note: In order to make this setup work, and to successfully ping between workstation1 and workstation2, you need to make sure that the default gateways on the workstations are setup properly. For workstation1, the default gateway should be 10.10.11.1 and for workstation2, the default gateway should be 10.10.10.1. For details on how to set the default gateways on the workstations, refer to their respective sections in this document. Note: The following paragraph is only applicable, if you have configured 802.1Q trunking between the router and the switch. Note: In order to make this setup work and to successfully ping between workstation1 and workstation2, you need to make sure that the default gateways on the workstations are setup properly. For workstation1, the default gateway should be 10.10.11.1, and for workstation2, the default gateway should be 10.10.10.1. For details on how to set the default gateways on the workstations, refer to thei respective sections in this document. This command is used to check the administrative and operational status of the port. It is also used to make sure that the native VLAN matches on both sides of the trunk. The native VLAN is used for untagged traffic when the port is in 802.1Q trunking mode. Refer to Creating and Maintaining VLANs on Catalyst 2900XL and 3500XL Switches for details on native VLANs. This command is used to check the VLAN trunking protocol (VTP) configuration on the switch. In our example, we have used transparent mode. The correct VTP mode depends on the topology of your network. For details on VTP, refer to Creating and Maintaining VLANs on Catalyst 2900XL and 3500XL Switches.